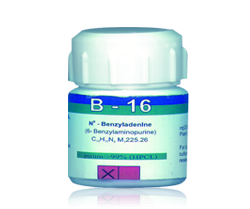 B16 is a Plant Growth Regulator based on 6-Benzylaminopurine, benzyl adenine (BAP) formulation. 6-Benzylaminopurine, benzyl adenine or BAP is a first-generation synthetic cytokinin that elicits plant adenine (BAP) is a synthetic cytokinin which together with auxins elicits plant growth and development responses, growth and development responses, setting blossoms and stimulating fruit richness by stimulating cell division. It is an inhibitor of respiratory kinase in plants, and increases post-harvest life of green vegetables 6-Benzylaminopurine, benzyl. Benzylaminopurine treated plants averaged 6 lateral shoots while untreated plants at 2. At the same time plant height was unaffected. Higher number of applications with the higher concentration Benzylaminopurine used to generate bigger flowers and better fruits. It increases lateral branching and promotes flowering to improve crop marketability and maximizing profits.